Essie’s Fox novel set in Victorian London, The Somnambulist, published in May 2011, was quite a treat for fans of historical mysteries. She started her career as an illustrator and an editorial assistant but now she is becoming a master of Victorian gothic mystery novel. Dividing her time between Windsor and London, she is working on the second novel. 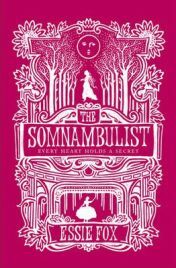 After reviewing The Somnambulist we were curious to know more about research and story behind Essie’s literary debut. CBF: What attracted you to the setting of Victorian England? What do you think is most interesting about that period? Essie Fox: Oddly enough, when I first started to write I was planning on something contemporary. But every time I began, a character or some ‘item’ from the past would crop up and intrude on the novel’s plot – a letter found under some floorboards, or an antique ornament which had some past significance. Finally, I realised that these were the parts of the story that gave me most ‘excitement’ – and as I’ve always enjoyed reading Victorian novels, whether the old classics or modern day versions, I decided to take the bull by the horns and see if I could do it too. CBF: Where do you do your research? Essie Fox: Ah yes, research. There has to be an awful lot of background work before you can write confidently about another era. And, even if you then dispense of the detail (which it is often a wise thing to do, to avoid information overload competing with the actual storyline) you still have to be confident about your place, and time, as well as its influence on character. If you as the writer don’t have faith in the world you create then you certainly won’t convince the reader. Successful fiction is all about the suspension of disbelief and entering a totally ‘different’ world. To research those worlds, I go to libraries, and sometimes I buy books. I also find information by Googling – lots of Googling – which no-one should be ashamed of. There is a lot of nonsense on the internet, but also a wealth of information. You simply have to be careful and verify your sources. But it is an excellent place to start, especially when you are coming from a position of no knowledge whatsoever. And, in all honestly, I often find myself wondering how other historical writers managed to gather so much information before the digital revolution. CBF: You use a lot of real settings in your novel. How did you prepare for writing about them? Did you learn a lot of new things about the places you used in the book when writing? 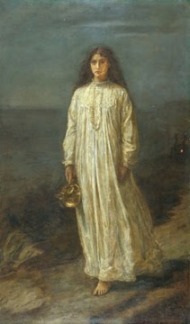 Essie Fox: I visit museums, and I look at the art of the era which often brings entirely new inspiration – such as seeing the Millais painting called The Somnambulist, which I thought a wonderful title. On further research I discovered that it was based on Wilkie Collins’ novel, The Woman in White, and perhaps also a famous opera about sleepwalking called La Sonnambula, at which point I knew it would be perfect to include that image in my novel as it summed up so much of the plot, and also what I love about the literature and art of that time. I also like to walk around Victorian streets – of which London has so many – trudging past all of the places where my characters might once have chanced to exist. But the setting of Wilton’s music hall, which is where The Somnambulist opens up, actually chose me, rather than me choosing it. I went there one night for a performance of Handel’s operetta, Acis and Galatea, and found myself absolutely entranced by the crumbling magic of the hall, seeing the glint of the lights bounce off the brass barley twist pillars and the pretty papier mache screen that fronted the single balcony. I felt so inspired and I knew then and there that I wanted to write a story based around that hall, but even so I had no idea that when I woke up the next morning I would have three very distinct and fully formed female characters in mind – and from that point on, The Somnambulist was born. As soon as I started to research the history of Wilton’s, many other colourful characters arose. I also went on to learn a great deal about Victorian East London – for instance, the work of the Salvation Army, and life around the docks, as well as the Bryant and May match factories, and the building of Victoria Park – not to mention a real life murderer who lived in Tredegar Square, which is where my narrator, Phoebe Turner, grows up. The other main setting in my novel is a house in rural Herefordshire which, despite being renamed in the book, from Hampton Court Castle to Dinwood Court, also really does exist and can be visited today. As a child, I often played in the woods around that house, but I only went inside the doors when working there as a cleaner one university summer holidays. I found the place to be ‘haunting’ and it’s always remained very clear in mind…as if it was only waiting for me to write The Somnambulist. CBF: Who are your favourite authors? Which writers inspire you most? Essie Fox: Oh – I have so many! I’m quite an eclectic reader, but I suppose for writing inspiration… Chaucer, Shakespeare, Daniel Defoe, the Brontes, Wilkie Collins, Charles Dickens, Virginia Wolf, Evelyn Waugh, Graham Greene, Muriel Spark, Isabel Allende, and Marquez – and more recently, and more in the generic vein, Sarah Waters, Charles Palliser, and Michael Cox, not to forget the wonderful Michelle Lovric. CBF: What book(s) are you reading at the moment? Essie Fox: The Reluctant Fundamentalist by Mohsin Hamid, and also The Salt Road by Jane Johnson. I’m longing to read The Games of Thrones cycle of books after becoming addicted to the television dramatisation – but I will simply have to wait until my next novel is done before I can make the necessary time commitment for such an epic fantasy – though I’m told the books are fabulous, in very more ways than one! CBF: Are you writing another novel? When and where is it set? Essie Fox: Yes. I have a two book deal with Orion and am now engrossed in the second one. The time is Victorian again, and this time it’s about an artist who is obsessed with painting his muse as a mermaid. The settings are West London, with houses alongside the Thames, and also a small village in Herefordshire – which is actually where my mother lives, so I know that village very well! CBF: As a writer, do you find the internet helpful or a distraction? Essie Fox: I LOVE the internet. As I mentioned before it’s such a wonderful source of information, and friendship too. That is a blessing for a writer, when isolation is such a necessary part of your working life, but even so, it can get lonely at times. I‘ve met some wonderful friends via Twitter – both virtually, and now in the flesh as well. But, I need to be stronger and try to restrict my ‘tweeting’ time as it’s all too easy to spend hours there when you really should be working. CBF: You have a blog called the Virtual Victorian, including lots of other stories and pictures and other Victorian stuff, some related to your novel and some not. How have you found this helpful in writing and promoting your novel? Essie Fox: I hope so but, honestly, if not then I really don’t mind. I have such fun writing the blog and it means I can research areas that have nothing to do with my writing but which, nevertheless, I find fascinating. I get so excited when I learn something new, and I am simply grateful that other people seem to like reading it too. CBF: Are there any other questions you wish I had asked? Essie Fox: No, I think your questions have been pretty comprehensive, and I only wish I had more time to answer them more fully than this. Thank you so much for the interview – I’ve really enjoyed it. 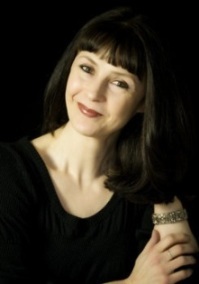 Thanks to Essie Fox and elkiedee for making this interview for Curious Book Fans. You can find Essie Fox on her blog Virtual Victorian or Twitter. No Comments on "Q&A with Essie Fox"